Star Micronics POS printers are quick printing, reliable, functional and affordable for your QSR. 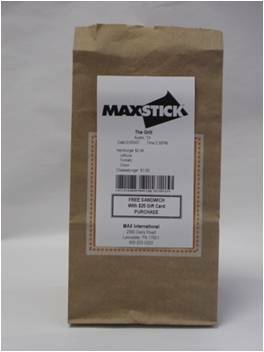 Improve accuracy in the kitchen and pick-up areas by using MaxStick™ liner-free labels / receipts with our TSP654SK printer or in your POS for printed orders and bag tags. Saving money and time on needless incorrect food orders is a very large concern. Wasted time will be minimized -- no more replacing and switching unreliable printers in the kitchen and at the POS stations. By purchasing a reliable Star printer, you can count on to work every time. Make the most of your receipts by adding logos, coupons and new menu items with a software working independent of your POS software, futurePrnt software by Star Micronics (the software included with the TSP100III series printers). TSP654SK - The TSP654SK is an enhance version of our legacy TSP650 thermal receipt printers. Utilize Max-Stick™ liner-free labels from Max International for multiple uses within your QSR for any repositionable paper application. The Star/MaxStick™solution could save you thousand of dollars by just allowing you to mark your "Exception" orders. - no incorrect orders and food waste! Thus identifying each special orders using the easy removable sticky receipt (ticket) - - no incorrect orders and food waste! Exception/Addition Food Orders: Stick it on the tray or on the box. The TSP654SK recessed cables protect connectivity (Ethernet, USB, Serial, Parallel). With its "drop in and print" paper loading, small footprint and reliable guillotine cutter there is never a delay in, "serving the next customer, please"! TSP100III Series - A must see when selecting point of sale hardware, everything you need for printing is included in the box including the renown, "futurePRNT" software. The software give you the power to design your receipts the way you want them to look and works independent of the POS software. Design coupons, surveys, community event promos, add you website to the margin and bring your customers back time and time again to your restaurant. The embedded power supply will save space along with the vertical stand, and add a splash proof cover for "accident prone" areas. TSP100ECO - Star’s commitment to being ecologically responsible, while allowing Star to continue to provide a high-speed, software enriched printer, the economical and ecological choice for QSR. The savings adds up quickly, this printer can save you 75% power consumption and up to 70% receipt paper savings. Act today and see the savings and be ecoligically responsible! SP700 Series - Offers durability of a heat resistant housing for hot kitchen environments with printing after a buzzing alert. Quick dot matrix printing of kitchen food orders catch the attention of the cook at the sound of the alert, low paper sensors and a viewing window to the receipt paper supply to advise paper status. Connectivity of Ethernet, USB, Serial and Parallel, an embedded power supply (no extra bricks on the kitchen racks or floor) complete this dependable kitchen printer. TSP650IIcloudPRNT - Star Micronics' TSP650IIcloudPRNT makes the perfect solution for the growing trend of online ordering for take-out and delivery food service. The TSP650IIcloudPRNT thermal printer retrieves and prints orders from any online ordering service integrating Star's communication protocol. CloudPRNT will work with the online ordering service to store and create print jobs, and communicate status with the printer.